The Internet and the ongoing digitization of media have transformed media landscapes and in turn the social functions of media and the structure of both governance and markets. In recent years, there has been widespread concern about the ability of the media to maintain and develop their role as a pillar of democracy. Issues regarding freedom of expression, freedom of information and freedom of the press are more complex than ever. The Nordic region - Denmark, Finland, Iceland, Norway and Sweden - is among the most technology-intensive and "wired" regions in the world. These countries are similar in many respects, including their media systems. In the era of globalization, however, the Nordic countries are undergoing change on many fronts. From the point of view of welfare politics and democratic processes, these changes pose numerous challenges. 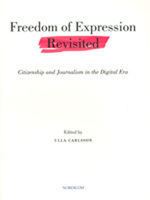 The theme of this volume - Freedom of Expression Revisited. Citizenship and Jounalism in the Digital Era - could be summarized as critical perspectives on experiences and conceptions of freedom of expression and the media in contemporary communication societies. The book reflects Nordic as well as global perspectives. The contributors are leading Nordic scholars, but also professionals outside the Nordic region, who have been engaged for years in research on freedom of expression from different angles.